Like what you've seen? Shobhna is available to do workshops on papercraft. Simply drop her a message to find out more. Shobhna Patel is a freelance illustrator based in North Lincolnshire, UK. 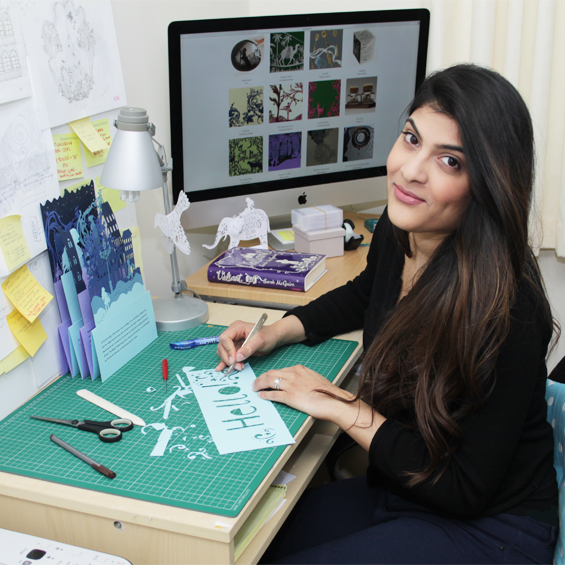 With a huge passion for creativity, she specialises in paper-cutting and paper-engineering. Graduating with a First Class honours degree in Graphic Design from DeMontfort University in 2012, Shobhna has since been commissioned for publishing, advertising and promotional projects in both the UK and the US. Some of her work has also been exhibited in a London art gallery. When not at her desk, Shobhna can be found reading books - she is highly influenced by literature and is motivated by classics written by Dickens, Brothers Grimm, Hans Christian Anderson and poetry which captures exceptional imagery. How would you describe your work to someone who has never seen it before? I specialise in two areas, paper-cutting and paper-engineering. Paper-cutting is a method of creating illustrations with paper, by cutting designs into a sheet of paper with a scalpel or scissors (I prefer to use a scalpel as it allows more freedom of movement). The end result holds a very sweet and dainty charm and when photographed can cast beautiful shadows. Paper-engineering on the other hand is a method of creating sculpture-like forms with paper. The end result of paper-engineering is a smart, 3D paper object, which can also be cleverly engineered to create movement, open and close, become longer and shorter or convert into another shape. The possibilities with what you can create with paper are endless. While most people may not realise it, paper as a material can be fairly easily manipulated. I think I have at least 3 typical days of art-making which differ from one another, however each I go through with every project, and each I have repeated over and over again. Day 1: Create moodboards of ideas, brainstorms, colours, styles of lines, what's currently on trend. I try to do as much research and planning as possible, this takes up almost a day, however by the end of the day I will have created numerous quick sketches of my ideas until I arrive at the look and feel that I'm after. This process is quite crucial in order to get on paper exactly what it is I can visualise in my mind. Day 2: Draw up the final design. Seek final approval. Source the different coloured papers or cards as per the design, this can take a while! A colour has to be spot on - sometimes I find paper stock which can be too blue, and I'm after more of a bluey-green, too orange and I'm after more of a coral, it can get quite ridiculous and I hate to think what onlookers may think of me when I'm shuffling through thousands of coloured papers in a craft shop, but it's necessary!! Finally, I source all other materials and tools which I will need, to begin the creation of the final artwork. How long does it typically take you to finish a piece? I depends really on what I am creating. Book jackets and illustrations can take around 1-2 days depending on how intricate the design. A paper-engineered novelty book can take me around 4-7 days. How did you start off in the arts? How/when did you realise that you were an artist? I've always known that I wanted to be an artist, since the age of 4! Throughout my secondary education I was well known for my artistic talent by teachers and students; different teachers always told me that I had a natural artistic talent which I must pursue. However, it wasn't always so great! During my A-Levels due to changing schools my grades within Art and Design subjects started to decline. After sitting my A-Levels, I attended an interview for a Foundation Diploma in Art course at college, the art tutor looked at my portfolio as if to say "Oh please…NEXT!!!" – it was mortifying, however after starting the course the same tutor apologised for misjudging me and was highly impressed with the artistic ability I displayed, I was even awarded a 'Most Outstanding Artist' award at the end of the course – it still stands with great pride on my mum's fireplace! During my Foundation Diploma course at college, my passion for art and design flourished, and as I started pushing my artistic abilities I realised how important a career in the creative industry was to me. What contemporary artists or developments in illustration do you find interesting right now? Rob Ryan, Helen Musselwhite, Kate Forrester and Su Blackwell are my sources of inspiration. Looking at all four I am able to see the endless possibilities with paper and how working with this media can create an outcome which can be commercially viable. These artists specialise in working with paper, however they all utilise completely different methods from eachother. I'm also motivated by books. I love books - mostly children's books and novelty books. I find them fascinating! I like to buy books to read the story, look at the illustrations or the fantastic paper-engineering – and then take it apart, to figure out how it was created, genius ideas behind the book and how I can work to improve upon a concept whilst adding a touch of my own style. My all-time favourite book is ABC3D by Marion Bataille. What do you do (or what do you enjoy doing) when you're not creating? I enjoy reading, baking and going travelling with my husband. This website and all its content © Shobhna Patel 2017. All rights reserved.